have the same approach to motherhood: every one lays eggs. No bird gives birth to live young. 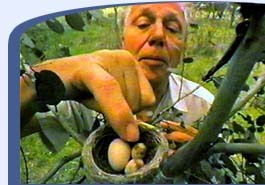 Birds quickly form and lay an egg covered in a protective shell that is then incubated outside the body. Birds developed much great mobility than a mammal, but at the cost of being unable to carry its growing offspring about in its body. Unlike, say, a dog carrying a litter of puppies. Just as an aircraft cannot fly if it is overweight, all female birds must dispense with the fertile egg as soon as it is formed. And because the egg is such a protein-rich high-nuitrition prize to all sorts of predators, birds must find a secure place to hatch their eggs. Although birds' eggs appear to be fragile, they are in fact extremely robust. The oval shape applies the same rules of engineering as an arched bridge; the convex surface can withstand considerable pressure without breaking. This is essential if the egg is not to crack under the weight of the sitting bird. It takes 26 pounds of pressure to break a swan's egg and 120 pounds to smash the egg of an ostrich. Finding a place to safely place and hatch their eggs, and raise their young to the point of independence, is a challenge birds have solved in many clever ways. They use artistry, intricate design and complex engineering. The diversity of nest architecture has no equal in the animal kingdom. In many species the male bird's skill at nest building is a sign of his suitability as a mate; he invests huge effort in the task. Males of the European house wren build up to 12 nests to attract females. They will continue to build new nests until a female is happy with the construction. Many birds build isolated, inconspicuous nests, hidden away inside the vegetation to avoid detection by predators. Some of them are so successful at hiding their nests that even the all-seeing eyes of man has hardly ever looked on them - birds like hummingbirds and manakins, for example. One secretive nester, the marbled murrelet, locates its nest high in the canopy of ancient Douglas firs over 300 years old. One of the most remarkable ploys of placing its eggs out of reach of most predators is demonstrated by the African palm-swift. It uses its own saliva to glue its nest, a little pad of feathers, to the vertical underside of a palm frond. The two eggs are also glued to the nest and the parents incubate them by turns, clinging to the nest. Birds employ the most astonishing strategies to conceal their young from predators. The female hornbill seals herself into the nest and stays inside the tree cavity throughout incubation, leaving only a tiny aperture. But she was careful to spend a few days testing the male's ability to provide her with food before she committed herself to laying. Birds will use any available material that they can carry away to build their nest - leaves, sticks, mosses, lichens, feathers. The Australian Yellow-faced honeyeater sometimes filches the thick fur from the back of a koala, a large bear-like mammal, to line its nest. Ovenbirds are some of the finest nest building craftsmen. They make a variety of nests, ranging from clay domes to stick nests, with intricate tunnel entrances and even underground burrows. In many species females will carefully peruse the design and quality of the nest the male has build. 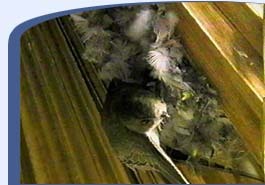 If she likes it, she will move in; if not, the nest may be discarded or destroyed by the male. The hammerkopf builds what must be the most extraordinary construction in the bird world. The huge, domed nest up to six feet high and across, is made of sticks, reeds and grass and can weigh up to 50 kg. 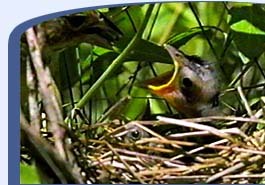 The nest is placed in a tree fork, on a cliff or on the ground. The whole structure may take 6 weeks to build. There is so much room that many other species, such as weaver birds, mynas and pigeons, attach their own nests to this ample frame. The sociable weaver in Africa constructs the largest and most spectacular of all communal bird nests. The enormous structure with its multiple nest chambers looks like a large haystack in a thorny tree. Up to a 100 pairs may nest in it. Oilbirds in Venezuela nest in the pitch dark of caves. The ledges behind the mile wide Iguacu Falls on the Brazil-Argentina border are among the most secure nesting places of all. In the permanent damp inches from a constant deluge the great dusky swifts have found the last word in safe houses. Some birds actively cooperate with other species. By nesting close to animals better equipped to deter predators, the birds are inadvertently protected by their neighbors. A very unusual cooperation in breeding has evolved between members of two different bird species. The small red-breasted goose breeding on the Siberian tundra is extremely vulnerable to predation by arctic foxes. The geese have established a working relationship with another inhabitant of the arctic tundra. The peregrine falcon nests on the tundra at the same time, and this small but fierce bird of prey is able to ward off the hungry arctic fox. Red-breasted geese nest in tight knots around the nests of peregrine falcons, benefitting from the protection that the bird of prey offers. The peregrine does not prey on the geese and their young. In return, the loud alarm calls of the geese alert the peregrine, which has its own chicks to protect. The swooping vicious attacks of the peregrine falcon soon deter the fox from coming any nearer. Another ploy is to employ insects as "guard dogs". The rufous naped wren builds next to wasps' nests for protection. The rufous woodpecker [different species, despite the similarity of names] nests in the middle of an ants' colony. The ants' fury soon subsides and is transferred to any intruder that tries to steal the eggs Some birds do without a nest altogether. The Emperor penguin, which breeds in the middle of the Antarctic ice cap, where temperatures drop as low as -40C, is the only species of bird to lay its eggs directly on to snow. There are other birds that dispense with every convention of home making and parenthood, and resort to cunning to raise their families. These are the "brood parasites," birds which never build their own nests and instead lays their eggs in the nest of another species, leaving those parents to care for its young. The cuckoo is the best known brood parasite, an expert in the art of cruel deception. Its strategy involves stealth, surprise and speed. The mother removes one egg laid by the host mother, lays her own and flies off with the host egg in her bill. The whole process takes barely ten seconds. Cuckoos parasitize the nests of a large variety of bird species and carefully mimic the colour and pattern of their own eggs to match that of their hosts. Each female cuckoo specializes on one particular host species. How the cuckoo manages to lay eggs to imitate each host's eggs so accurately is one of nature's main mysteries. Many bird species learn to recognize a cuckoo egg dumped in their own nest and either throw out the strange egg or desert the nest to start afresh. So the cuckoo constantly tries to improve its mimicry of its hosts' eggs, while the hosts try to find ways of detecting the parasitic egg. One of the most extraordinary examples of deception is practiced by the screaming cowbird. This bird only dumps its eggs in the nests of bay-winged cowbirds. Unlike in any other known brood parasites, the screaming cowbird chicks are absolutely identical to the chicks of the host at the stage when they are dependent on the parents for food, Then, as soon as they fledge, they take on the plumage of their own species. Another bird that gets away with great deception is the whydah, an African bird with a remarkably long tail. It dump its eggs into the nests of little finches. But the whydah chick does not evict its nest mates; instead it grows up with them. The whydah chick looks completely different from the host nestlings. But when it opens its mouth, the resemblance is remarkable - the young whydah has a gape and mouth spots that closely mimic those of its nest mates. The hard-working parents see no difference in the row of open mouths and feeds them all equally. The struggle between host and parasite is akin to an arms race, each trying to out-survive the other. But two birds take the struggle up to that old Cold War level MAD - mutually assured destruction. When the gnatcatcher realises the cowbird has laid in its nest, it takes the extreme step of tearing the whole place apart, destroying its and the intruder's eggs in the process. Then it starts all over again. We hear much about manipulative youngsters in human society. But the young of some birds manage to manipulate their parents even before they leave the egg. The chicks of the American white pelican tell their parents when they are too hot or too cold by giving loud and clear distress calls from inside the eggs. This helps the parents incubate the eggs correctly; they respond to the calls by turning and re-settling on the egg. The greater honeyguide in Kenya is another parasite. It lays its eggs in the nests of the red-throated bee-eater. But its chicks, when they hatch, have a deadly advantage. They are armed with a murderous hook-tipped bill. The chicks of the red-throated bee-eater die under the vicious attacks of the honeyguide chick within the first few days of hatching. The murder weapon then drops off, its purpose achieved. The foster parents now devote all their energy towards feeding the killer of their own young. The black eagle, which nests on cliff ledges in Africa, is a species whose second chick is always doomed. It always lay 2 eggs. 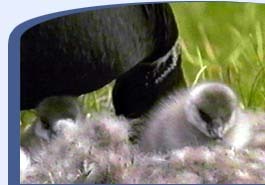 The chicks hatch about 3 days apart, so that the older chick is significantly larger than the younger one. But no matter how abundant the food supply may be, the parents can only ever manage to raise one chick. The extra egg they lay is simply an insurance in case the first one is lost or fails to hatch. If both hatch successfully, the older sibling launches a relentless, killer attack upon the younger chick the moment it hatches. Birds only behave brutally or with deceit because it works in terms of their own survival. But there are many examples of what we would recognize as "good" parenting. 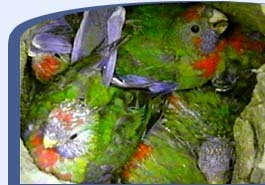 And are rosella parrots the bird world's perfect parents? Listen to how much they care. The eggs hatch over about five days, so at first there is a noticeable size difference between their chicks. You might expect the older ones to win. But, unlike many other birds, these parrots are scrupulously fair in feeding. They make sure every nestling receives its proper ration. Sometimes the eldest will share its food with the youngest and weakest. The result of this consideration is a truly balanced family. After three weeks strength and weakness will have been ironed out and the nestlings are all the same size. Perhaps the biggest and happiest of bird families are the Arabian babblers of Israel. These birds display an admirable family togetherness. They all play a part in feeding the baby birds. Among white-winged choughs four adults are deployed to feed one young, because the beetle grubs they eat is so difficult to find. But they will also kidnap young from another family, enticing them away by spreading their wings like a toreador's cloak. The youngster is fed for the first season, then recruited into the feeding team in the next year. The result is a bigger "family", capable of raising more young. In British Colombia the Barrows goldeneye also choose the extended family option. The female goldeneye will chase another female off the lake, but is happy to let the rival's abandoned offspring join her family. She may end up with 20 ducklings in tow, only half of them her own. This is not as altruistic as it seems. She does not have to feed them. And if a pike attacks, the odds are 2 to 1 against hers' being eaten. In Australia, the magpie geese family is often headed by a male and two egg-laying females. When the time comes to conduct their young across a river to the lagoon where they feed, the three parents will snap at marauding crocs, a act of heroism that could easily lose them their heads. Looked at as a whole, however, birds are not a lot more virtuous or dutiful in their home-making then humans. For example, it has long been thought that birds were the animal kingdom's best representatives of the romantic virtues. The courtship of birds, and their apparent togetherness, has inspired poets, songsmiths and advertising copywriters. We assumed birds don't cheat. Well, they do. Birds find it pays to deceive their partner as they seek to gain the edge over others of their species, and ensure that their chicks grown to maturity and carry on the lineage. Although around 90 per cent of bird species form a parental pair, at least for a given breeding season - a higher figure than among other creatures - there is more deception than was ever suspected. Monogamy is not an instinct, hard-wired into animals' brains, as was thought. Even birds considered as paragons of fidelity will indulge in a fling if the situation permits. The notion of settled married bliss has been blown away by the new technology of DNA fingerprinting, which has revealed that as many as a fifth of the eggs produced by female birds believed to be monogamous had not, after all, been sired by their regular partners. Scientists now know that many females two-time; that they even practice divorce. There is jealously; there are "home-wreckers." Jealous female warblers competing for the attention of a male have been caught smashing their rivals' eggs by biologists in Sweden, in this fascinating experiment. 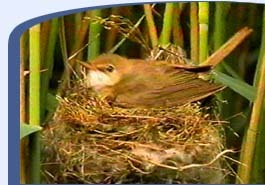 The male great reed warbler may have several females nesting in its territory, but only the lucky "primary" female whose eggs hatch first get his help in rearing her young. Staffan Bensch and his colleagues at Lund University in Sweden placed lifelike plasticine eggs in nests kept from previous years. Newly arrived females, thinking the nests belonged to primary females, pecked holes in the plasticine eggs. However they left the incriminating outline of their beak. The team was able to show that the pecks of jealous female warblers accounted for one-third of all egg attacks, with predators of other species accounting for the rest. Professor Nick Davies at Cambridge University discovered quite unexpected infidelity in the humble dunnnock, a small, retiring sparrow-like bird found in British gardens, and previously thought to be a model of marital probity. Davies and his colleagues used DNA fingerprinting to prove that female dunnocks had been unchaste - there was clear DNA evidence that the chicks in a single nest had different fathers. The female dunnock may be a busy two-timer. However the superb fairy wren of Southern Australia is the most promiscuous bird in the world. Both males and females have multiple partners. Scientists conclude that what the sexes seem to be doing is widening their options, indulging in extra-marital liasons to increase their chances of breeding successfully. Lewis Oring of the University of Nevada, Reno, studies the killdeer, a North American plover. He has found "home-wreckers"--individuals that break into the relationship drive out their rival and pair with its mate. Some males act as a "hired gun" to protect females from predators or males that would kill their young. Steve Emlen at Cornell University contends that female bee-eaters form pair bonds with additional males to reduce the levels of harassment from the many males that hang around their communal nest sites. In time all birds must leave the nest - provided they have survived the many dangers of home life. There is a great deal of variation in how independent the young are once they hatch from the egg. Among most perching birds, seabirds and birds of prey, the chicks hatch after fairly short periods of incubation and need to be fed for a long time. In other species, such as geese, swans, ducks and waders, the young develop for a long time within the egg and are fully feathered and ready to run about and feed by themselves almost as soon as they leave the egg. Some can even fly. The chick that is perhaps the most independent at birth is the ancient murrelet, which is taken to sea almost as soon as it is born. It responds to its parents urgent calls when it can neither fly nor feed on its own. But one young bird has virtually dispensed with the need to be looked after. In Argentina the cuckoo duck egg is dumped by its mother in the nest of an unsuspecting brown hooded gull. Then, after just one day, it ups and leaves the nest to fend for itself. Surely, it is the most self-sufficient bird on earth.